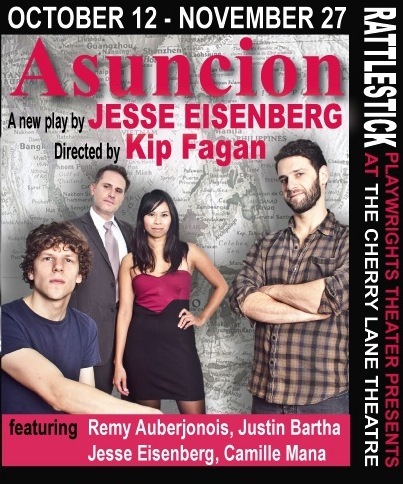 In Jesse Eisenberg’s new play Asuncion, directed by Kip Fagan, two educated, but perhaps not as broad-minded as expected, American roommates have their lives rocked when the goofier one’s Filipina sister-in-law moves in. Set in a shabby apartment in Binghamton, New York, the play has a realistic set, from the filthy door to the tiny kitchen, which lends the perfect backdrop to the acting onstage. Best Actor Oscar nominee for The Social Network, Jesse Eisenberg stars in the play as Edgar, the same scared-of-his-own-shadow character Eisenberg usually plays, but even more anxious this time around. He’s a blogger/aspiring writer who is a roommate (if sleeping on a beanbag in the living room qualifies anyone as roommate-status) to Vinny played by Justin Bartha (The Hangover, National Treasure) his Africa-studying, stoner-mentor, previous-TA-turned-roommate whose chillaxed attitude offers a comic departure from Edgar’s own neurosis. Enter Asuncion, played by Camille Mana (Smart People), Edgar’s sister-in-law who needs a place to stay for the weekend. She is the wife of Edgar’s Wallstreet-type brother, Stuart (Remy Auberjonois, and while the roommates pride themselves on their cultural awareness, the only way Edgar can relate to the Philippines-born Asuncion is from his two-day experience in Cambodia. Assumptions (and you know what they say about assumptions) are drawn, weed is smoked and ultimately feelings are hurt. The play is entertaining with plenty of laugh-out-loud lines volleyed between Eisenberg and Bartha. Mana is very funny, as well, with over-the-top energy. In a delicious pop songs and giggles performance, Asuncion’s exuberant dancing around the apartment is a highlight of the play. The ongoing dialogue about racial assumptions is relevant and thought-provoking, and even though when we finally find out the reason Asuncion is there in the first place, it is brushed over way too quickly, the play benefits from a modern script with clever lines, good acting and a quick pace. If sociology class was this entertaining, maybe kids would learn a little more.